FILE - Russian S-400 surface-to-air missile defense systems are on display during a parade at Red Square in Moscow, Russia, May 9, 2015. As Russian President Vladimir Putin visits India, the most high profile item on the agenda will be a deal for New Delhi to buy a multi-billion-dollar air defense system and other weaponry. If concluded, the deal will be in violation of American sanctions against Russia. The potential agreement comes as an indication that India will continue its defense ties with Russia, even as it deepens a military and strategic alliance with Washington. President Putin is scheduled to hold formal talks with Prime Minister Narendra Modi on Friday. "The key feature of this visit will be the signing of the agreement to deliver S-400 air defense systems," Vladimir Putin's top foreign policy aide Yury Ushakov has said ahead of the visit. India says it needs the missile system that provides high altitude protection from incoming missiles to bolster its defenses against China and Pakistan. The Russian-built S-400 is capable of intercepting and destroying airborne targets at a distance of up to 400 kilometers. New Delhi is hoping for a waiver from the United States, which passed a law last year placing automatic sanctions on countries dealing with Russia’s defense and intelligence sectors. With an eye on China, New Delhi and Washington have been building a closer partnership. FILE - Russian President Vladimir Putin meets with Indian Prime Minister Narendra Modi in the Black Sea resort of Sochi, Russia, May 21, 2018. 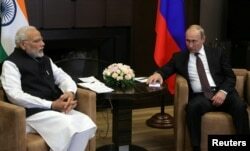 Modi is expected to host Putin for talks Friday. However, U.S. officials have said there is no guarantee for such a waiver and have urged India not to enter into transactions with Russia. Last month, Washington imposed sanctions on China’s military for its purchase of the S-400 missile system from Russia. The planned purchase of the S-400 missile system also demonstrates India’s continued reliance on Russian military hardware, once its primary supplier of weapons according to defense analysts. Although New Delhi has diversified in recent years and the U.S. has emerged as its second biggest source of arms, Moscow still remains an important source of weapons. The sophisticated missile system will not be the only deal on the table. The two countries are also are expected to discuss the sale of frigates and helicopters – deals that could be worth $3 billion. “It is not practical to think India will be able to reduce its dependence on Russia or it can close its options of buying from other countries,” says defense analyst Amit Cowshish at the Indian Institute of Defense Studies and Analyses in New Delhi. He also points out that Russia has always been easier about sharing sophisticated defense technology with India compared to Washington. Analysts say the visit and the likely conclusion of some military deals will likely give a boost to India's ties with Moscow, which had become cooler in recent years as Russia developed closer ties with rival China.